There was a recent period when slime was the main leisure activity of many of the fourth- and fifth-graders at my kids’ school. Parents found their supplies of Elmer’s Glue and shaving cream depleted, and their Tupperware forever stained with the vibrant shades of the sticky substance. Sure, it was a great improvement over screen time, but it made a hell of a mess. 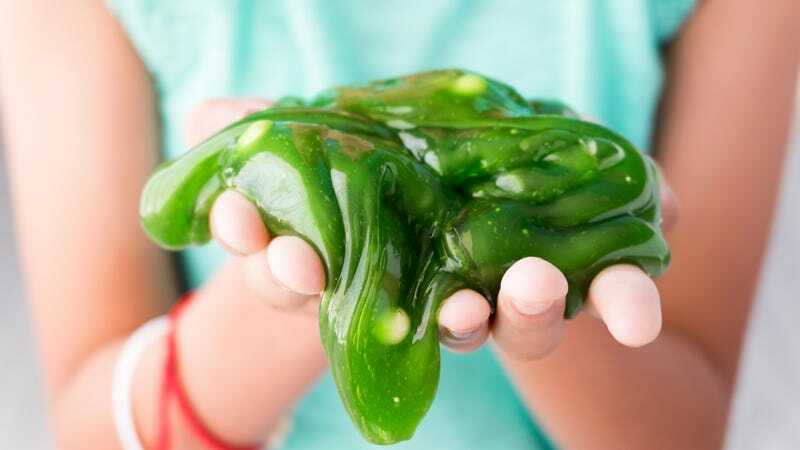 Always one to jump right into the kids’ mess game, Jell-O now announces its own slime, just ahead of the holidays. As appropriately reported by Ghostbusters News (below), the new slime comes in shades/themes of Unicorn (pink, tastes like strawberry) and Monster (green, tastes like lime). As a slime vet, I am a bit wary of this idea, especially for younger kids, who may now have to be very careful when differentiating between edible slime and non-edible slime. Also, it kind of eliminates the fun, almost-science-project element of mixing all those household items together to make your favorite slime. But what do I know? The not-even released yet product (December 1) is at this writing the number-one bestseller under Grocery & Gourmet Food on Amazon, retailing for about $10 for a can that will make two batches of slime. Early customer reviews (not sure how these parents got theirs already) are a bit disappointing, apparently putting the edible slime in the “just because you can eat it, doesn’t mean you should eat it” category. Comments so far range from likening it to “instant pudding” to “strawberry sawdust vomit.” Maybe just stick with the Elmers’ glue/shaving cream combo, parents. And don’t eat it.